Bob Proctor is a phenomenon. He has inspired tens of millions of people by teaching them why they need to start living up to their potential and how to do it. Whether it’s in your career, relationships, health (Bob is 81 and accomplishing more each day than people half his age! ), finances, or any other area, Bob’s specialty is helping you to uncover what’s been holding you back and providing a clear map on getting where you want to be. Bob will tell you, there isn’t anything that makes him particularly special. There are just a few key principles that he applies everyday that has led to his overwhelming success. 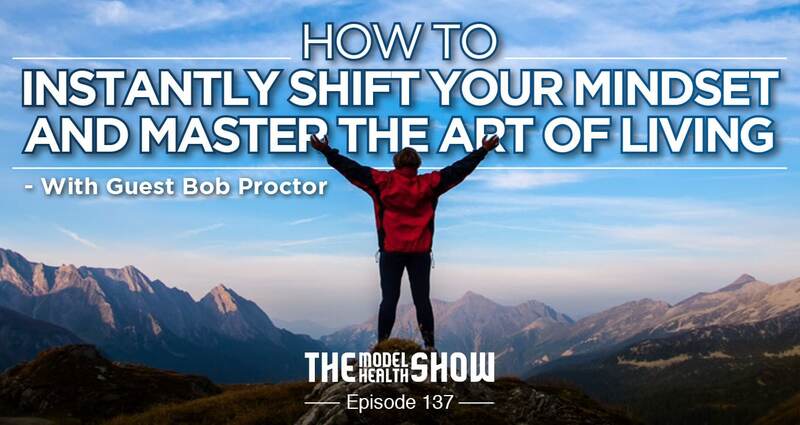 Today you’re going to learn exactly how Bob thinks, and some extra valuable tips to help you make this your best year yet. Why we are encouraged to use our imaginations very early on, but then quickly taught to suppress it. How you actually get to choose everything you do (even if you don’t realize it!). What mindset shift you must make if you’re going to start living life on your terms. Why Bob feels that you should have more energy as you get older, not less (and he should know… he’s 81 years young!). Why “work” isn’t really made for us (and how work is tied to your longevity). The 3 things all of us really want. What simple exercise you can do to get out of your excuses and start living the life you want. Why it’s important to analyze who you are and where you are right now. Why learning from someone who already has what you want is absolutely critical. What mindset shift someone can make to help them improve their financial health. Why there’s only one quality that we really need to make our dreams a reality. How writing and achieving goals can be so difficult and mentally misleading. What exciting goal setting exercise you can utilize for this year. The Art of Living – Pick up Bob’s new book right here! Thrive Market – Get your exclusive FREE 2-month membership now! Thank you for the blessing of your show. I love how the video presentation gets slicker and more beautiful every episode! I very much appreciate your programming Bob Proctor again. I can literally feel him reaching out to me with his motivating words, and those words – along with your extraordinary expertise and Jade’s production and insight – are just everything! Can I ask you what tools/platform you are using to capture the video and sound? It sounds like Bob Proctor is in the room with you, not on video conference! Tara! Thank you so much for the wonderful message. So sorry it took a bit to reply. To answer your question, we are simply using Skype lol. We’ve had to play around with it quite a bit to ensure that it’s consistent (i.e. hardline vs. wifi), but it’s just one option that’s out there. Thank you, Shawn! I appreciate your taking the time to answer my question. I will look into the skype options. Be Well and Thank you again!